Guitar players can use several types of scales and patterns to play melodies, riffs, and solos, but some are used far more than others. For example, the plain major scale and Mixolydian mode are very common, while Lydian mode is rare. Also, the natural minor scale and Dorian mode are common, but Phrygian mode isn’t. And with them all, guitarists often prefer to work within a familiar pentatonic scale box. In the examples that follow, you stay centered on the same primary pitch, A. You play A major and A Mixolydian, then A minor and A Dorian, sticking in pentatonic pattern 1 the whole time. But this key is just used as an example. Once you get the lead patterns down, you can apply them to other keys. 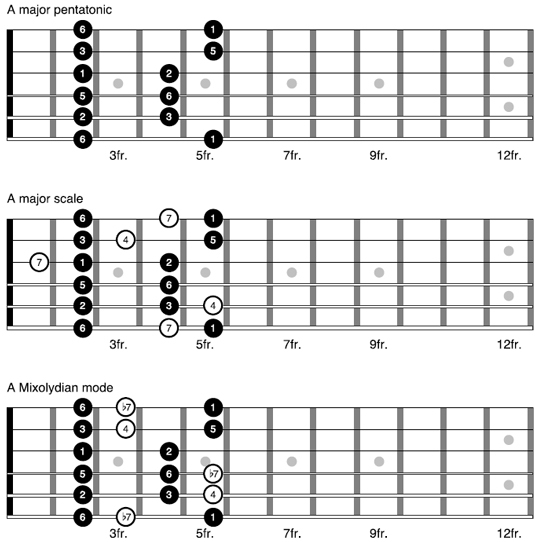 In the following image of A major lead patterns, you see A major pentatonic, followed by the same pattern with notes from the full A major scale, and then A Mixolydian mode. 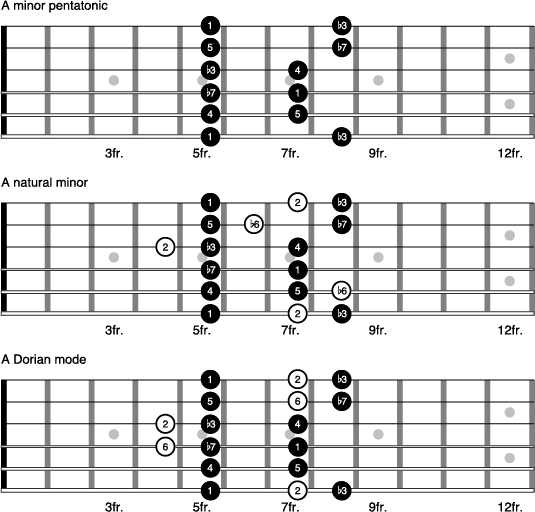 The A major pentatonic pattern in the first fretboard diagram is your base. Notice that because you’re playing in a major key, the pattern actually begins three frets lower than the tonic pitch. To make the pentatonic pattern a full major scale, you add in 4ths and 7ths as shown in the second diagram. This is what you use anytime you’re playing over a progression in Ionian mode, which is the plain major scale. The second most common major mode is Mixolydian. To change your lead pattern to fit over progressions based in the 5th mode, flatten the 7ths. You see b7ths used in the third diagram. When you play in major keys, you typically use either plain major or Mixolydian, so these two patterns have you covered most of the time. If you’re unsure if a song is in plain major or Mixolydian, just play through each lead pattern and listen for which one is the better fit. Specifically, listen to determine whether the major 7th or minor 7th sounds right. An example of a song that you can use the A major scale lead pattern on is “What’s Up?” by 4 Non Blondes. Play the A Mixolydian lead pattern over “Franklin’s Tower” by the Grateful Dead. Next, work with A minor pentatonic. In the following image of A minor lead patterns, pentatonic pattern 1 has been moved up three frets from the previous major examples. In this position, the pattern starts directly on the note A. To play a full minor scale, add in 2nds and minor 6ths as shown in the second diagram. To play in Dorian mode, raise the minor 6ths to major 6ths as shown in the third diagram. When you play music in a minor key, it’s mostly likely to be natural minor — such is the case, for example, in the guitar solo section to “Stairway to Heaven” by Led Zeppelin. If another minor mode is in use, it’s probably Dorian, as is the case in “Oye Como Va” by Santana. So these two lead patterns cover most minor keys. Notice that the plain A major scale and natural minor scale use identical patterns. The only difference is where you start them. For A major, you position the pattern so that it starts three frets below A. For A minor, you start right on A. Because the major and minor scales form the same pattern, you really need to be familiar with only three lead patterns in all. These three patterns are major/minor, Mixolydian, and Dorian. Many guitar players never use much more than these.